As the IoT unfolds it’s critical, says Tony Milbourn of u-blox, not to lose track of what really matters and to provide the technologies, modules and security to keep them robust and reliable. In April 2011, Cisco IBSG predicted that 25 billion devices would be connected to the Internet, and 50 billion by 2020, thus feeding the Internet of Things (IoT) frenzy we’re experiencing now. While ideas for what to connect have flooded the market, not all ideas or designs are equal: now is a good time to identify what really matters and bring forth the technologies that will make sure these applications function accurately, reliably, and securely so we can depend upon the data we analyze and the outcomes that analysis produces. The fabric we now call the Internet of Things was knit beneath our feet long before Cisco’s declaration, starting with the first message across ARPANET (the foundation of what is now the Internet) in 1969. That first message – the two letters “/” and “o” didn’t really matter at the time, as the system crashed and they had to rejigger it to get the next real message (login) transmitted. Since then, of course, much has changed, and a lot of messages that really do matter are now being ferried back and forth between systems ranging from automotive, industry and agriculture, to city infrastructure and emergency services. It doesn’t really matter if a fridge “forgets” to put a food item on the shopping list, but it does really – really – matter if a car misjudges distance, if a manufacturing line goes down because of a failed motor, or an emergency first responder can’t be found in time because of lost location and failed communications signals. Preventing this from happening by sensing, gathering data and analysing that data toward improved and even predictable processes and outcomes is the lure of the IoT. However, this can only be achieved with accurate data from the right sensors supported by robust reliable cellular and short-range communications as well as precise location and time information. This forms the trifecta the what, where, and when of the IoT to provide rich contextual data to better inform decision makers. Getting this accurate data and communicating it reliably and cost effectively requires close attention to the device and interface choices from a full product life-cycle point of view. For example, it may be tempting to design a wireless module from the ground up, but this can lead to a quagmire of RF design and layout issues, not to mention regulatory compliance processes and delays. These all add up and if this isn’t your core expertise, it may be best to opt for a module and work with the module supplier on integration and antenna placement for optimum performance. There are many module suppliers with support for various interfaces, from Bluetooth and Wi-Fi to cellular (GSM to LTE), but choose carefully as the things that matter most can often be in environmentally challenging locations. Look for full automotive AEC-Q100 qualification over extended temperature ranges of -40˚C to +105˚C. Also look for ruggedness, with physical vibration and electromagnetic noise immunity, as well as close attention to security. Figure 1. As the number of nodes on a network expands, so too do the attack surfaces, so all must be secured in order to establish a chain of trust, strengthened by five security pillars. As the IoT grows, security continues to loom large as a concern so it must be addressed at every step, all the way from the sensor, IC, module, board, system, and communications interface, to the gateway, cloud, and back again. 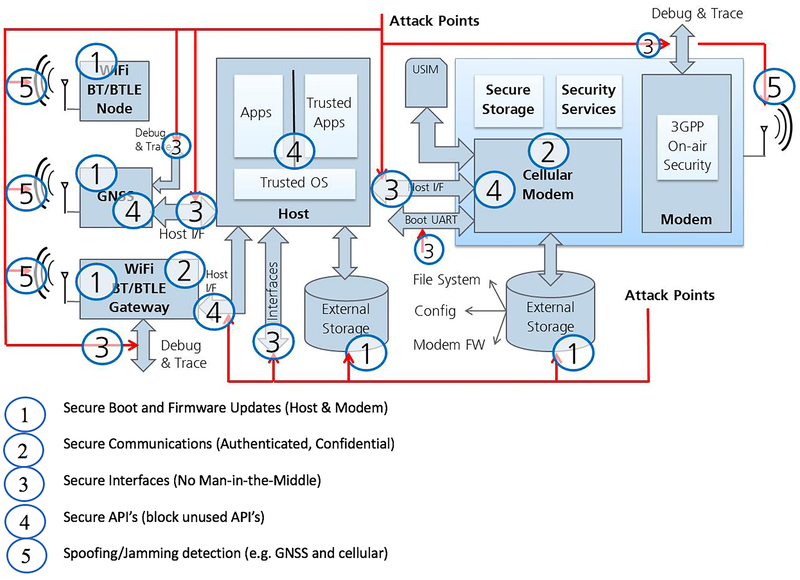 To this end, a chain of trust must be forged that encompasses five main pillars: device firmware and Secure Boot; communications to the server; interface security; API control; and robustness in the face of spoofing and jamming. With security established as a priority, the other key elements to look for in an implementation include for the Internet of Things that matter include low-latency and low-power wireless interfaces: it’s not much good having the data if it can’t be gathered reliably. While Bluetooth low energy and Wi-Fi are critical parts of the wireless connectivity basket of options, when it comes to communicating between vehicles and infrastructure (V2I) such as lights or between other vehicles, faster response times and lower latencies are necessary. For example, the steering sensor in on vehicle must be able to transmit the steering trajectory quickly to nearby vehicles such that those vehicles and their drivers can sound an alarm or take evasive to avoid a collision. That’s where integrated IEEE 802.11p comes in. 802.11p is an amendment to the 802.11 (Wi-Fi) standard that allows for data exchange between high-speed vehicles and between the vehicles and the roadside infrastructure in the licensed ITS band of 5.9 GHz (5.85-5.925 GHz). As it’s is a completely different physical layer, it could mean more cost in terms of physical hardware as well as software and regulatory compliance. But if 802.11p is already supported in a module, along with cellular, Bluetooth and even global navigation satellite system (GNSS) positioning, a large chunk of that cost disappears. Along with communicating between IoT devices and from IoT devices to the cloud, providing the “where and when” things happen can provide rich context to support analyses, from simple route mapping and vehicle lane changing, to tracking first responders in emergencies. Accurate position down to <1 m is already available though GNSS, but augmentation of that through angle of arrival (AoA) and angle of departure (AoD) can get location down to 1 cm. Alloyed with accurate base station-derived time stamping down to the millisecond, as well as local temperature and over environmental and biomedical sensors, and the full context of anyone or any event within a robust IoT network can be ascertained. As the potential of the IoT unfolds, the things that really matter are becoming clearer, as are the systems and expertise required to make them reliable and robust, from hardware modules through to security, as well as new interface, positioning and time-stamping technologies and approaches. The author of this blog is Tony Milbourn, vice president of Corporate Strategy, u-blox.